The card is in excellent condition. You are getting the exact card(s) listed in title and shown in the photo. 2013 Topps Chrome KEENAN ALLEN Pink Refractor ROOKIE! PSA 9 Mint RARE #130/399! THEY'RE BEING SOLD AS IS. KEENAN ALLEN 2013 Topps Chrome PINK Refractor Auto RC # 39/75 * Excellent Condition* Please See Pictures For Details Or Please Message Me If You Have Any Questions Or Would Like Any Additional Pictures. I Am Open To Fair Offers Thank You For Looking ! WELCOME TO BAKENDAVE'S E-BAY STORE. WE ADD NEW ITEMS AND SHIP DAILY. YOU WILL RECEIVE ACTUAL CARD SHOWN IN THE SCAN AND DESCRIBED IN THE TITLE. CARD HAS NO OBVIOUS FLAWS. WE WILL NOT OFFER AN OPINION ON HOW THE CARD MIGHT GRADE OUT. WE PROVIDE A CLEAR SCAN SO YOU CAN JUDGE THE CONDITION FOR YOURSELF. WE WILL NOTE ANY FLAWS OR DEFECTS THAT WE THINK ARE PERTINENT. CHECK OUT OUR EXCELLENT FEEDBACK AND BUY WITH CONFIDENCE. IF YOU ARE NOT HAPPY WITH THE ITEM SIMPLY RETURN IT FOR A FULL REFUND. CHECK OUT OUR AUCTIONS FOR CARDS & SUPPLIES STARTING AT .99 - NO RESERVE. KEENAN ALLEN. RED REFRACTOR. ROOKIE CARD. Sports Card deals! The card(s) is/are in NRMT/MT condition. SALE RIGHT HERE! 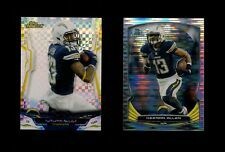 2013 Topps Chrome KEENAN ALLEN #1 1986 Refractor ROOKIE! PSA 9 Mint RARE #81/99! 2013 Topps Platinum Keenan Allen Rookie Jumbo 4 Color Patch # 7/59! THERE WERE ONLY 59 OF THESE CARDS MADE AND THIS IS CARD #07/59! Panini HRX. You get all (5) cards pictured in the scan. 2013 Keenan Allen Topps Triple Threads Rookie Patch Auto /99 Patch R-Cards 🔥. Condition is Brand New. Shipped with USPS First Class Package. WELCOME TO BAKENDAVE'S E-BAY STORE. NEW ITEMS ADDED DAILY. YOU WILL RECEIVE ACTUAL CARD SHOWN IN THE SCAN AND DESCRIBED IN THE TITLE. CARD HAS NO OBVIOUS FLAWS. WE WILL NOT OFFER AN OPINION ON HOW THE CARD MIGHT GRADE OUT. WE PROVIDE A CLEAR SCAN SO YOU CAN JUDGE THE CONDITION FOR YOURSELF. WE WILL NOTE ANY FLAWS OR DEFECTS THAT WE THINK ARE PERTINENT. CHECK OUT OUR EXCELLENT FEEDBACK AND BUY WITH CONFIDENCE. IF YOU ARE NOT HAPPY WITH THE ITEM SIMPLY RETURN IT FOR A FULL REFUND. CHECK OUT OUR AUCTIONS FOR CARDS & SUPPLIES STARTING AT .99 - NO RESERVE. (12)-435 Keenan Allen (Rookie). (07)-220 Philip Rivers. These contain all base & rookie cards for the team listed (1-440). Cards average NrMint condition - Included players listed below (01)-011 Manti Te'o (Rookie). Photos are the exact item you will receive. Any questions feel free to ask. If you would like additional photos, please ask. We will not guess grades on any item posted, which is not already graded, as we are not in anyway professional graders. Please see photos for condition, we will not give out any estimation on BGS or PSA final grade. Returns are not accepted on this item. All sales are final. Payments due within 4 days of purchase, please contact with any further questions. GET THIS BEFORE IT'S GONE! 2013 Topps Triple Threads Keenan Allen Rookie Auto Triple Patch 1/1 RARE HOT! Card Condition: Graded 10 Pristine Black Label by BGS. Blue Refractor Parallel Version. Centering 10, Corners 10, Surface 10 ,Edges 10, Auto 10. Autograph in Blue Ink (On Card Auto). Where you'll always find exquisite value, exquisite quality, exquisite service and.